The following information is my preferred feeding program for a pup age 5 to 12 weeks. 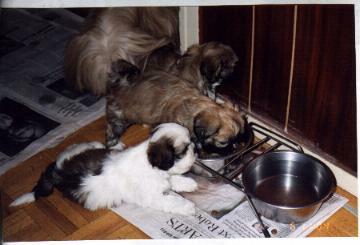 Amounts fed and numbers of times fed per day vary with the age and size of the individual puppy. Other breeders may have their own schedule for feeding a puppy. If your breeder gives you instructions on feeding your new pup, please follow their recommendations. If you are concerned that you are not feeding the pup enough food, please visit your veterinarian for further instructions. Ask the breeder when you pick up the pup, how much the pup is eating per meal, and how many times per day, they are feeding him/her. Also, find out what brand of dog food they are using. Changing brands of dog food too quickly can cause diarrhea. Feed your puppy 3-4 meals a day consisting of 1/4 to 1/3 cup of quality puppy food for each meal. Add 1 teaspoon of canned (lamb & rice or chicken or puppy food) to dry food (micro-wave the teaspoon of canned food for 10 to 15 seconds to warm then add to dry food). A bowl of dry dog food should always be available for nibbling on as the puppy is teething. Do not add canned food to this dish. Fresh water should always be available. Using a water bottle to drink from helps keep the dogs face dry and clean (a guinea pig water bottle will do nicely). Avoid giving the puppy milk as he/she has never been given cows milk and it may cause diarrhea. Please Remember: that as the puppy grows, the amount of food you will feed him/her will increase (e.g., 1/4c. to 1/3c., 1/3c. to 1/2c.). At approximately 3-4 months, reduce to 3 meals a day. At 4-6 months, reduce to 2 meals a day. The puppy should be eating about 1/2 cup or more per feeding. This amount may vary from day to day depending on activity level of the pup. At 6 to 8 months, reduce to 1 meal a day. Biscuits (1 or 2) may be given in the morning and again in the evening for a snack if the puppy is hungry in between. Many people prefer to feed their dog twice a day. This is ok as long as you are not overfeeding him/her. A fat puppy / dog is NOT a healthy dog. At 1 year, your dog should be put on Adult dog food. He / She should be eating approximately 1 cup per day. If the dog cannot seem to eat 1 cup of food all at once, you can feed him/her 1/2 in the a.m. and the other 1/2 in the evening. Always introduce a new food very gradually and check to ensure that the puppy does not develop diarrhea. Proper nutrition is very important to the development and growth of your puppy. Feed him/her a good quality, high protein dog food. Treats should be restricted to dog treats only. Dog cookies are an excellent treat and help to reduce tartar on teeth, but do not overdo it. Too many treats will cause your pup to eat less dog food. He / She will not be getting all the nutrients he/she needs to grow up healthy and strong. Brewers' yeast & garlic tablets help to promote a healthy coat and reduces the chance of getting fleas. This may be added to his/her dog food or they can chew it. Dogs do not need variety in their diet. Changing food can cause upset stomach & diarrhea. DO NOT FEED: CHOCOLATE EVER AS IT IS TOXIC TO DOGS. NEVER let your puppy chew on houseplants as many are poisonous. E.g. English Ivy, Dieffenbachia, Philodendron, and Caladium.